Overview - Po joins forces with a group of new kung-fu masters to take on an old enemy with a deadly new weapon. Dreamworks needed a hit, bad. Before the first 'Kung Fu Panda' we had to endure 'Flushed Away,' 'Shrek the Third ,' and 'Bee Movie.' While their biggest rival Pixar churned out fan favorite 'Cars' and critical darling 'Ratatouille' in the same time period. It was clear they really needed a franchise that could attract the kids but also appeal to adult sensibilities. 'Kung Fu Panda' was it. Not only did the lush animation finally make it feel that Dreamworks was knocking on the door of Pixar quality, but the story and characters were fun, inventive, and at their core, emotional. However, it's hard to get lightning to strike twice. That's the case with 'Kung Fu Panda 2.' We're once again reintroduced to the main characters. We have The Furious Five, with their newest member Po. An overweight Panda, who inexplicably became the Dragon Warrior in the first movie, voiced by Jack Black. 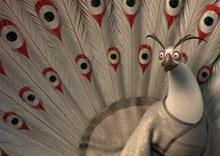 Po and his band of kung fu masters have learned that an evil, power-hungry peacock named Lord Shen (Gary Oldman) has created a weapon more powerful than kung fu. Harnessing the power of gun powder Lord Shen threatens to lay waste to all of China. It's been a running joke in 'Kung Fu Panda' that Po is obviously adopted. His father is a goose, but Po is still somehow oblivious to that fact. Things change in this movie as we learn along with Po about where he came from, how he ended up with his adopted father, and what happened to all the pandas in the land. The first film had Po trying to overcome his physical drawbacks; the second film is centered more around Po's emotional demons. The drawback of the second installment in this franchise is that the first half of the movie feels too much like a Saturday morning cartoon special. Rehashing the same jokes, reintroducing us to characters we already know. Juvenile potty humor and comically over-the-top fight scenes all serve to undermine the much better second half. Once we start learning more about Po's past the movie switches gears. No longer is it merely a movie to showcase fluffy animals beating the stuffing out of each other. After the stiff first act is in the past, the movie starts to develop into a rather emotional tale. We find out about Po's past during some truly harrowing flashbacks. Po's origin story adds emotion to a film that was, until now, riding along on the same old jokes as the first movie. The flashbacks feature some rather glorious 2D animation which reminds us that it can be just as spectacularly amazing as 3D animation. The action scenes in the second half are also better. They become more focused. They serve a purpose, to further the story of Po's checkered past. 'Kung Fu Panda 2' really is the story of two halves. The first half is total kiddie fare. It's light-hearted, but much of the wonder is lost because we've already been introduced to this world and these characters in the first film. The second half, however, is worth staying around for. This Dreamworks release comes in a Blu-ray/DVD combo pack. The movie has been pressed onto a 50GB Blu-ray Disc. The extra DVD copy of the film also has the Digital Copy on it. This is only a 2-disc combo pack. The release comes with a slipcover which features the same artwork as the case. Was there any doubt that this movie would be less than perfect when it came to being presented in outstanding 1080p? Nah! I expected nothing less than perfection when I stuck this in my Blu-ray player and that's exactly what I got. Dreamworks' animation is lush and vibrant. Lines are clean and distinct. Watch as individual strands of hair and fur wave in the wind without the slightest hint of aliasing. Check out the immaculate detail of Lord Shen's intricate tail feathers. When the 2D animated scenes show up they shine as well. The detail of the hand-drawn characters shimmers, offering a nice respite in between all the high-flying 3D action. Blacks are tremendously deep. Colors are superb. Check out the contrast between the darkness of Shen's war factory compared to the hot whites, reds, and oranges of the molten fires creating his secret weapons. Textures are presented with the utmost care, from Shen's elaborately decorated robe to the architecture inside Shen's palace. There isn't a detail misplaced or misused. 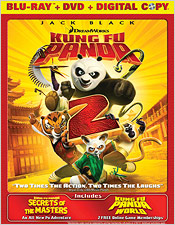 Rest assured when you pick up 'Kung Fu Panda 2' on Blu-ray you're picking up a demo release through and through. The audio is no slouch either. Matching the 1080p transfer of 'Kung Fu Panda 2' pound for pound is the raucously fun 7.1 Dolby TrueHD audio mix. This is simply an audio experience that you'll pull out from time to time to really show off the capabilities of your 7.1 system. It showcases every channel and makes great use of the extra speakers. Ambient sound is always active. The rear speakers are constantly alive with far off action or people milling around town. Dialogue is clear up front and directionality works well as Po and his comrades fly from one side of the screen to the other taking out bad guys. Their voices and sound effects travel with them from a side speaker through the front and center speakers and on to the opposite side. Panning effects are always smooth. LFE is constantly a deep, thumping presence. The low boom and whoosh of cannonballs is one of the best things about this soundtrack. Even the LFE presence in the other speakers is more than adequate. Every time we get that hollow boohooing when Po's pudgy stomach comes in contact with enemy fists or the ground, the low sound reverberates through the speakers creating a perfect echoing effect. Like the video the audio mix is simply worth owning. It will make a great addition next to your other demo worthy Blu-rays. Audio Commentary – Nelson is joined by Producer Melissa Cobb, Production Designer Raymond Zibach, and Supervising Animator Rodolphe Guenoden to offer up the commentary for 'Kung Fu Panda 2.' The important thing here is that even though it covers much of the same material as the picture-in-picture Animator's Corner special features discussed below in the Blu-ray exclusives, it isn't the exact same. Here the filmmakers talk technically about creating a 3D/2D hybrid film. Nelson also discusses the script and story. It's origins, characters, and purpose. 'Kung Fu Panda: Secrets of the Masters' (HD, 23 min.) – This short film, done mostly in 2D animation (although there is some 3D too) is about the masters from Gongmen City. We learn the backstory of Masters Storming Ox, Master Croc, and Thundering Rhino. True to Dreamworks' short movie form it does tend to be a bit cornier than it really should be, but it may be a good distraction for the little ones. 'Kung Fu Panda: Legends of Awesomeness' (HD, 24 min.) – This is a single episode from the Nickelodeon series. The episode is entitled "Has Been Hero" and is obviously a sneak peek in order to get you to start watching the show. Kickin' It with the Cast (HD, 13 min.) – The standard look behind the scenes at the famous voices having fun recording their lines in the sound booth. Deleted Scenes (HD, 4 min.) – Not much here, except for a few test scenes that never made it into the final cut. Director introductions are included with each of the three scenes: Fight Club: Bartender Scene, Po Chasing the Crow, and Po in Gongmen City. Panda Stories (HD, 8 min.) – This is a short look at the real-life plight of endangered pandas. Kung Fu Shuffle (HD) – There are two versions of the classic shell game here. One with Po and his crates and the other with barrels and bunnies. Ni Hao (HD) – A beginner's course in writing and speaking Mandarin. 'Kung Fu Panda 2' isn't as good as its predecessor, but it does accomplish the feat of entertaining its audience. Even though its first half is shallow and a bit sluggish, the second half lifts it up with its sheer awesomeness. 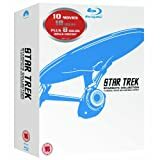 With stellar audio and video and a large selection of worthy special features this one comes recommended to all.